SIDEWALK CHRONICLES: Prayer Changes Things. 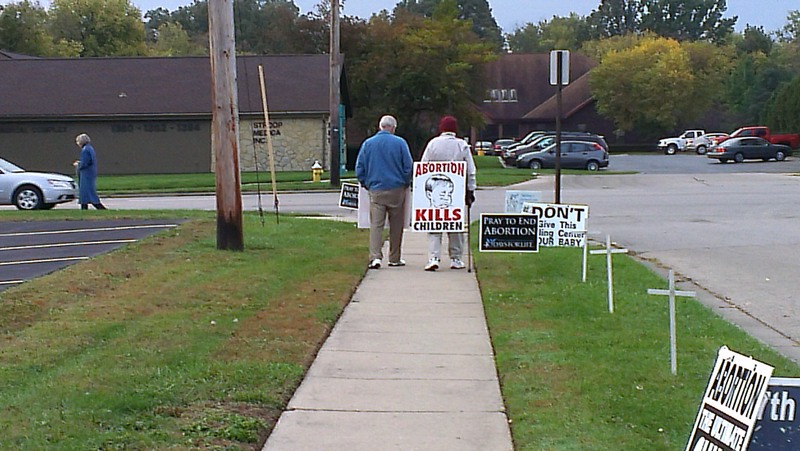 We are called to do a very uncomfortable thing: witnessing on the sidewalk of abortion facilities. One of those is at a facility that Martin Haskell owns. Just today [January 21, 2014], late-term abortionist Martin Haskell was denied a license by the Ohio Department of Health to operate one of his abortion facilities, this one is in Sharonville, Ohio. He has two other facilities, one of them in the same sinking position. Martin Haskell has patted himself on the back for pioneering the partial-birth abortion and gave Gosnell pointers in the ‘snipping’ procedure. We pray. And pray. And pray more. Prayer changes things. Because of prayer, an abortion facility will close and save MANY lives. But this is only one facility, many more are still murdering our unborn with no apology, over 4000 lives lost every day. Prayer is something that should never be taken for granted. We never know what God is doing or orchestrating to give us our heart’s desire. Ours is to see an end to abortion. God is certainly sovereign, but He is also providential. It is our own free will as humans that keeps us from doing His will. Abortion workers know that they are killing whether they are abortionists, receptionists, security guards or nurses; they choose not to do the will of God. INTEGRITY. We serve God with integrity, not in spite of Him. God hates abortion and seeks our obedience and service. As a nation, we are disobedient to Him and His will by allowing this evil within our borders, our lives and our churches. Abortion is a national and local tragedy. And it’s 100% preventable. Go to your local facility’s sidewalk and pray. Sign up for a vigil at your local 40 Days for LIFE location. Get your church involved, and if they won’t find another church. Prayer works – it shuts down abortion facilities.